The 2018â€“19 UEFA Nations League will be the inaugural season of the UEFA Nations League, a planned international association football competition involving the men's national teams of the 55 member associations of UEFA. The competition, which will be held from September to November 2018 (pool stage) and June 2019 (final four competition), will also serve as part of the qualification process for UEFA Euro 2020, awarding berths in the play-offs which will decide four of the twenty-four final tournament slots. What is it? How will it work? What is it trying to achieve and why does UEFA believe that it will improve the quality and standing of national team football? Find out here. UEFA is an association of associations and continually discusses and reviews both club and national team competitions with its members. So the rejuvenation of national team football and the UEFA Nations League stems from the desire of UEFA, and especially the UEFA President, to improve the quality and the standing of national team football. There is also the desire from the associations for more sporting meaning in national team football, with associations, coaches, players and supporters increasingly of the opinion that friendly matches are not providing adequate competition for national teams. Extensive consultation and discussions started as far back as the 2011 Strategy Meeting in Cyprus and continued at a series of Top Executive Programme (TEP) meetings over the past three years, namely: the UEFA general secretaries meeting in Stockholm in 2013, the UEFA Strategy Meeting in Dubrovnik in 2014, several meetings of the UEFA National Team Competitions Committee and most recently a series of follow-up regional TEP meetings across Europe. In addition, the UEFA Nations League will provide teams with another chance to qualify for the UEFA EURO final tournament, with four teams qualifying through play-off matches which take place in March 2020 (see below). The UEFA Nations League group games will take place over six matchdays, during the 'double-headers' in September, October and November 2018. The Final Four competition for the teams that win the four groups within the top division takes place in June 2019. The play-off matches will take place in March 2020 (see below). Will qualifying for the UEFA EURO change? 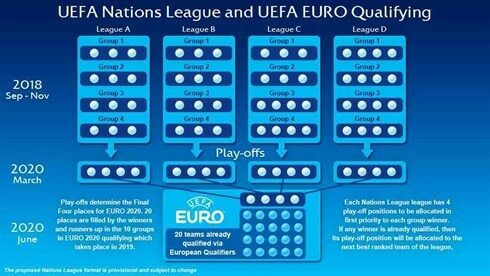 The changes to UEFA EURO qualifying make it more streamlined. The equation is now simple: 10 groups with the top two teams in each group qualifying automatically with other 4 places being awarded to UEFA Nations League play-off winners. But the key principle of the qualifiers remains, that every team can play every team. The European Qualifiers for UEFA EURO 2020 commence in March 2019. There will be two matchdays in each of March, June, September, October and November 2019. In total, there will be six groups of five teams and four groups of six teams (ten groups in total) playing over ten matchdays (the same number as now). The winner and runner-up in each of the ten groups will qualify automatically for the UEFA EURO 2020 final tournament (June 2020). â€¢ 16 teams will take part in the play-offs and are grouped four by four. Each group plays for one qualification spot. 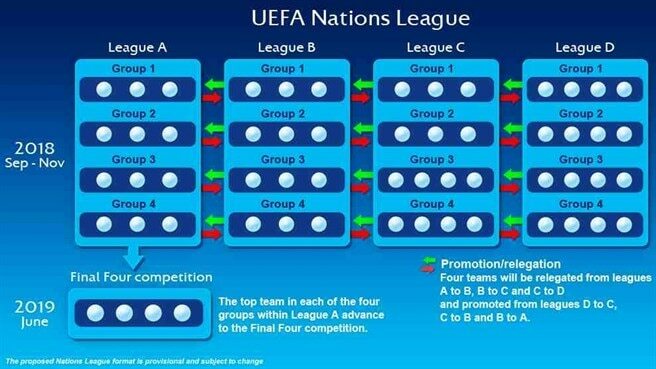 â€¢ Each of the four Nations League leagues receives four play-off qualification positions to be allocated to each of the four group winners within that league. â€¢ If any winners are already qualified through the European Qualifiers, then their play-off position will be allocated to the next best ranked team of the league in question, taking into account the global ranking within the league, then if necessary to the following league in decreasing order taking into consideration the global ranking of the relevant league. â€¢ The four teams in each league will play two one-off semi-finals and one one-off 'final' to determine each of the four play-off winners. National associations and coaches in consultations with UEFA revealed that they feel that friendly internationals are not providing adequate sporting competition. The UEFA Nations League creates more meaningful and competitive matches for teams and a dedicated calendar and structure for national team football. Top teams can also aspire to take part in the final four competitions, a new top-level event. For middle-ranking and small nations, the UEFA Nations League will provide an extra way to qualify for UEFA EURO final tournaments. Lower-tier nations − the bottom 16 in rankings − are now guaranteed one of the 24 qualifying slots for UEFA EURO. Lower-ranking teams who have struggled against teams ranked considerably higher than them will now get the chance to take part in balanced matches. Teams do not learn and progress by repeatedly losing; now some teams will start winning. While the UEFA Nations League will replace most friendly internationals, there will still be space in the calendar for friendlies, especially for top teams who may want to play teams from outside Europe as they will be in groups of three teams. Associations and teams benefit from clarity of the fixture calendar, and there is now a clear buffer between the end of UEFA EURO and FIFA World Cup, and vice-versa, and stability of income. Supporters more than most realise that most friendlies fail to provide competitive and meaningful football. Now they will get the chance to see their teams play in more competitive matches, take part in a new competition and get a second chance to qualify for the major tournaments. In every even year there are FIFA World Cup or UEFA EURO winners; now in every odd year there will be a UEFA Nations League champion. Football is about competition and now, just like in club football, there will be a national team champions at the end of every season. No; the UEFA Nations League and European Qualifiers will adhere to the existing agreed international match calendar. UEFA is always keen to preserve the balance between club and international football. The new competition should, in fact, reduce demands on players and clubs with less travel envisaged for friendly matches while national teams will be playing more consistently at their own level. With double-header matchweeks, players will even go back to their clubs earlier than is currently the case. There will certainly be fewer friendly internationals and undoubtedly fewer meaningless friendlies. However, there will still be space in the calendar for friendly internationals − particularly warm-up matches for final tournaments. UEFA is also keen that European teams will still have the chance to play teams from other confederations. Teams will be split into four groups of three, with the group winners then contesting the UEFA Nations League Finals (semi-finals, third-place match and final) in June 2019 to become the UEFA Nations League winners. One host country will be appointed in December 2018 from among the finalist teams. The top four-ranked teams that do not qualify for UEFA EURO 2020 will enter a play-off in March 2020, with one finals place on offer. Teams will be split into four groups of three. The four group winners are promoted to League A, with the four sides that finish bottom relegated to League C for the next competition, to be played in 2020. Teams will be split into one group of three and three groups of four. The four group winners are promoted to League B, with the four sides that finish bottom relegated to League D for the 2020 edition. Teams will be split into four groups of four, with the four group winners promoted to League C for the 2020 edition. The 55 participating teams were split according to their position in the UEFA National Team Coefficient Rankings following the end of the European Qualifiers for the 2018 FIFA World Cup (as per 11 October 2017, play-off results will not be included). League A includes the 12 top-ranked teams. The next 12 teams are in League B, the next 15 in League C and the remaining 16 in League D.
Teams in three-sided groups will play on four of the six matchdays. *Note that Russia and Ukraine will not be drawn into the same group. The same applies to Armenia and Azerbaijan if the current UEFA Executive Committee decisions still apply when the draw is made.